Our week-long intensive summer programs are a great opportunity to gain the experience you need in marine biology and ecology to be competitive for internships, jobs, and graduate school. All trips include variable amounts of classroom lecture and instruction depending on course goals; Field School staff are available for anything from in-depth lectures on marine biology and ecology to simply providing logistical support for course instructors. Trips are, unless otherwise specified, inclusive of all transportation once participants arrive at Research Vessel Garvin, and all housing and food costs (except for one "dinner out" at a local restaurant). Contact us here to start scheduling your trip! This course takes you into the field with The Bahamas Marine Mammal Research Organization (BMMRO) for an unforgettable 10 day expedition to track and learn about sperm whales. As part of BMMRO’s ongoing research, we’ll be using an acoustic array to track sperm whales as they swim, feed, and dive—in the hopes of learning more about their Caribbean population. We will also be contributing to a photo ID database of whales in the Bahamas and helping to place acoustic receivers. Once we make contact with a pod of whales, we will be actively tracking and following them using an acoustic array towed behind R/V Garvin, and participants will have the chance to learn acoustic and marine mammal research techniques from BMMRO’s experts while contributing to research that can aid the conservation of these amazing animals. Space on these trips is extremely limited! Research collected as part of this course contributes to numerous ongoing research projects at Field School, Coastal Carolina University and the University of Miami on shark feeding ecology, habitat use, stress physiology and morphology. This course requires students to have taken Field's Schools introductory Elasmobranch research skills course, or to have substantial previous experience working with sharks and rays. Feel free to contact us if you aren't sure if your experience satisfies the prerequisite! This field skills course is designed for students who are interested in pursuing their own research projects on sharks, particularly as part of their graduate study, or want to begin building the skills for a career as a research field technician. It will include advanced instruction on shark handling and workup procedures, including increased opportunities compared to the introductory course to practice shark handling skills. As part of this course, students will learn about drawing and processing blood from elasmobranchs, receive instruction on deployment of various kinds of tags in shark research (including suturing for implantable tags), and receive more advanced lectures and experiences designed to help you prepare to lead your own research. ​Students will gain further experience fishing in a range of environments, from estuaries to offshore sites, and learn to assess which fishing methods are most appropriate in different settings. They will be taught how to safely collect data from sharks of various sizes and species, as well as learning techniques for assessing and minimizing shark capture stress. In addition to field days, this course includes significant classroom and "skills lab" instruction. Because this course entails close collaboration with our staff, the chance to "shadow" them and learn the techniques they are using, and hands-on experience with sharks, a very limited number of spaces are available on each advanced course. ​Species that may be caught include: Atlantic sharpnose, lemon, sandbar, bull, nurse, blacktip, bonnethead, tiger, hammerhead and southern stingray. Join us for an amazing six day research adventure in the South Florida! This course will cover visits to mangrove and seagrass habitats, including restoration and monitoring techniques, lectures on coral reef biology and ecology (including reef snorkels and coral reef restoration and monitoring), instruction on tropical fish ecology and biology, including training in fish identification, and a hands-on shark tagging trip. Based on course goals, instructors are able to choose between special lectures and field work focusing on a variety of species. This course is extremely flexible and customizable, with options to add additional field days for a longer course. ​This 3 day workshop is ideal for students and researchers looking to learn R programming quickly in an immersive, hands-on setting. Live and learn aboard the RV Garvin for 3 days during which you will rotate through small group sessions introducing you to critical R skills and break sessions where you will have the opportunity to explore beautiful South Florida habitats from mangroves to coral reefs. .Our staff are able to offer a wide range of hands-on research experiences. Below are some examples of courses we can offer on request for private and university groups. For more information and available dates, please contact julia@getintothefield.com. Get hands-on experience using Underwater Remotely Operated Vehicles for marine science research. Course research will focus on South Florida where invasive species from lionfish to pythons are causing serious environmental damage. Gain critical experience with emerging technology you need to be competitive for internships, graduate school and the job market. This family-friendly trip is focused on marine megafauna in beautiful Bimini, Bahamas. The trip includes the crossing from Miami, FL to Bimini and the chance to observe a variety of wildlife, with a particular focus on Atlantic Spotted Dolphins and Hammerhead Sharks, two species which congregate in this area off the Bahama Banks in late winter. Participants will also have a chance to see and learn about coral reefs, mangroves, fish, nurse sharks, stingrays, and bottlenose dolphins. This trip is offered in partnership with our German partners, and will include translation for German-speaking participants. This family-friendly expedition is designed to give participants a chance to experience the Caribbean "off the beaten track". The trip includes the crossing from Miami, FL to Bimini, Bahamas. During the trip, participants will encounter a variety of marine life and marine ecosystems. This trip will include the opportunity to observe and help gather data on bottlenose and Atlantic spotted dolphins, sharks, rays, fish, and sea turtles. We'll visit and learn about many of the amazing ecosystems of the Caribbean: small islands, coral reefs, seagrass beds, mangroves, and even shipwrecks! This trip is offered in partnership with our German partners, and will include translation for German-speaking participants. This internship introduces students to the issues around plastic pollution in our oceans while they help remove marine debris from, and conduct research in mangrove, coral reef, beach and seagrass habitats. Students will learn how these systems interrelate, improve their marine species identification skills, and contribute to ongoing research projects studying the impact of marine debris on our oceans as well as marine wildlife including dolphins, turtles, and sharks. Students will also gain fundraising and public speaking experience, as they each become social entrepreneurs during the weeks leading up to the field course. This course is intended for students with a passion for coral reefs and tropical ocean systems. Lectures focus on the ecology and biology of reef-building stony (scleractinian) corals, and the array of plants and animals that call coral reefs home. Students will learn to identify 20 common species of Caribbean coral, as well as many species of fish, sharks, and invertebrates, and will be instructed in and practice many of the basic skills involved in coral monitoring and research. 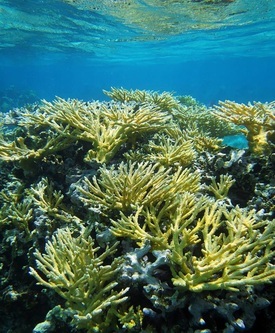 The course will include in-depth instruction on the threats facing corals, and discussion of available tools (both scientific and legal) for attempting to conserve remaining Caribbean reefs. For this course, basic SCUBA certifications are required as course content includes diving. If you are not SCUBA certified, please plan to take a certification course beforehand, or contact us before booking. This lengthier field adventure allows students to dig more deeply into the biology and ecology of South Florida's marine systems. On day 1, students will learn about the interdependence of offshore and coastal habitats, while participating in ongoing mangrove and fish community research projects. Day 2 will be spent in Biscayne National Park, exploring this unique intersection of marine, freshwater and terrestrial systems. On day 3, students will learn about the biology and ecology of coral reefs and snorkel in the first underwater marine park in the United States. The next day, student will have the opportunity to participate in ongoing turtle nest monitoring projects. They will spend the afternoon snorkeling on a coral reef, looking for turtles, sharks and rays. That evening will be spent exploring all that historic Key West has to offer. The next day students will embark for Dry Tortugas National Park. This remote park, on two uninhabited islands 70 miles west of Key West, will allow students to experience the natural environment of the Caribbean in a whole new way. There they'll learn about the history of the Dry Tortugas, including Fort Jefferson, as well as snorkel and gather data on some of the most pristine coral reefs in this part of the Caribbean. During their time in the Dry Tortugas, students will participate in gathering data for numerous research projects on reefs, fish, corals, rays and sharks. 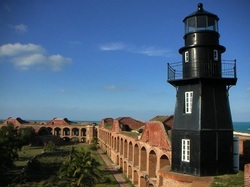 This course spends 2 days/1 night in Dry Tortugas National Park. After returning to the Florida Keys, students will spend a day shark tagging with the University of Miami's Shark Research and Conservation Program. Students will spend their last night docked in Miami for a final debriefing in preparation for their departure in the morning. This expedition takes students through the ecosystems of the Florida mainland, Florida Keys, and Great Bahama Banks. Over the first few days, students visit the mangrove, seagrass and coral habitats of South Florida, as well as the Everglades. This includes a choice of specialized focus on seabirds, turtles, or marine mammals based on course goals. 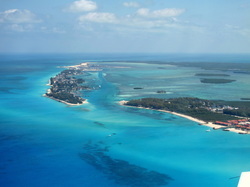 The course then travels across the Gulf Stream to beautiful Bimini, Bahamas. While there students will have a chance to encounter and conduct research on species including Atlantic spotted dolphins, bottlenose dolphins, southern stingrays, lemon sharks, nurse sharks, Caribbean reef sharks and a variety of Caribbean reef fish and corals. In addition to numerous field experiences, this includes a guided tour of the world-famous Bimini Biological Field Station, or "Sharklab". On our return from Bimini, students will overnight in Miami for a debriefing and question and answer session before heading home.